Offshore outsourcing- the movement of jobs to lower-wage countries- is one of the defining features of globalization. Routine blue-collar work has been going offshore for decades, but the digital revolution beginning in the 1990s extended this process to many parts of the service economy too. Politically controversial from the beginning, "offshoring" is conventionally seen as a threat to jobs, wages, and economic security in higher-income countries, having become synonymous with the dirty work of globalization. Even though the majority of corporations make some use of offshore outsourcing, fearful of negative publicity most now choose to manage these activities in a discreet manner. Partly as a result, the global sourcing business, reckoned to be worth more than $120 billion, largely operates under the radar, its ocean-spanning activities in low-cost labour arbitrage being poorly documented and poorly understood. 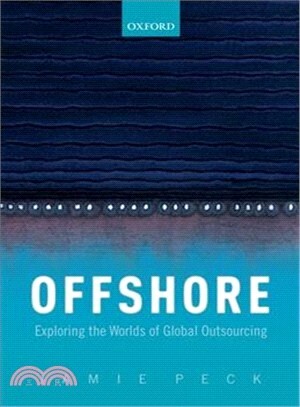 Offshore is the first sustained investigation of the workings of the global sourcing industry, its business practices, its market dynamics, its technologies, and its politics. The book traces the complex transformation of the worlds of global sourcing, from its origins in the new international division of labour in the 1970s, through the rapid growth of back-office economies in India and the Philippines since the 1990s, to the development of "nearshore" markets in Latin America and Eastern Europe. Recently, this evolving process of geographical and organizational restructuring has included experiments in "backshoring" within low-cost, ex-urban locations in the United States and a wave of software-enabled automation, which threatens to remove labour from many back offices altogether. In these and other ways, the offshore revolution continues. Jamie Peck is Canada Research Chair in Urban & Regional Political Economy and Professor of Geography at the University of British Columbia, Canada. His research interests include labour studies, economic restructuring, neoliberalization, and urban transformations. Elected to the fellowships of the Royal Society of Canada and the Academy of the Social Sciences, he has been the recipient of Guggenheim and Harkness fellowships, and received the Royal Geographical Society's Back Award for contributions to economic geography. He is the managing editor of the journal Environment and Planning A and the coordinator of the Summer Institute in Economic Geography.